“At least we can all agree the third one’s always the worst” says Jean Grey. It’s an inside joke, and well timed too, as the young teenage mutant exitsReturn of the Jedi alongside Night Crawler and Cyclops, but it nevertheless seems an unfortunate jest. Bryan Singer’s latest cinematic apocalypse is more of a spectacular visual effects extravaganza and can certainly tick most of the blockbuster check boxes – but it doesn’t offer much more. It’s frustrating because Singer is a tour de force when it comes to superhero movies and both ‘X-Men’ and ‘Days of Future Past’ were favourites, not because of the flashy aesthetics but because the characters had grit, emotional depth and the storyline offered more than daytime telly melodrama. The opening scenes are easily the most compelling. We are in Egypt, the land of the gods and pharaohs and here, almost 30,000 years ago, the god-father of all mutants, Apocalypse (Oscar Isaac) is about to experience a transference to a younger body to consolidate his powers. Yet at a crucial moment things go wrong and despite the efforts of his devotees, he lays encapsulated in the rubble, dormant but not dead. 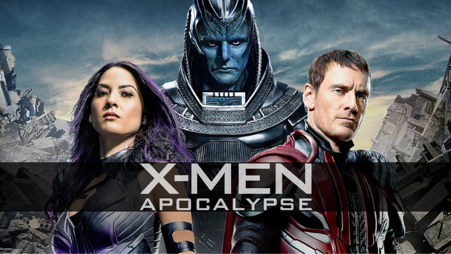 X-Men Apocalypse boasts brilliant cinematography, excellent camera angles, beautiful shots and it stirs a wave of emotion that swells but never peaks. Grant Major’s commanding production designs easily transport us across continents and d.p. Newton Thomas Sigel’s slick and subtle input is heightened by the skill of visual effects maestro John Dykstra. It’s a technically masterful work but Singer’s promise to take the third instalment to dizzying heights falls short, partly because Simon Kinberg’s non-stop action laden script leaves little room for exceptional storytelling – and that is its main problem. The plot itself spirals into two parallel journeys. Apocalypse’s 20th century resurrection in Cairo means that the time has come for new recruits. The young orphan Ororo (Alexandra Shipp), sensual Psylocke (Olivia Munn), the exile Angel (Ben Hardy) and Magneto (Michael Fassbender) who has been quietly living under an assumed identity in Poland, quickly join his ranks. Yet except for the back and forth between Magneto and Charles Xavier (James McAvoy) over whether the world can live with mutants, there is hardly any room for these new attaché de evil to make an impact on the wider narrative. Back in the familiar world of America in the 80s (yes there is Pacman and Eurythmics) another parallel story too unfolds. Young Scott Summers (Tye Sheridan) has a problem. His eyes hurt and he can’t control the explosive powers he has been given. His brother takes him to Professor Xavier’s school for the gifted where he discovers other recent arrivals including Jean Grey (Sophie Turner) and Night Crawler (Kodi Smit-McPhee). Crawler was brought to the school by shape shifter Mystique/Raven (Jennifer Lawrence) the latter who is desperate to find Magneto before others do. Nicholas Hoult (as the blue and hunky Hank McCoy) and Rose Byrne (as CIA agent Moira MacTaggert) are also familiar faces and add colour, if not much depth, to the general propulsion of the script. Amidst many explosions the slow destruction of Xavier’s school and the fact everyone was saved thanks to the timely appearance of Quicksilver (Evan Peters) is a highlight in the film. Peters utterly steals the show but it’s a pity he doesn’t get too much more screen time. Overall it’s a predictable film that has all necessary ingredients to be a smash-up box office success. The end of the world is nigh and it has to be confessed, it does look pretty spectacular (and probably less scary) than it would have sixteen years ago without all the magic of visual effects. There is the compulsory blood streaking scenes, some quite elegant, others delightfully adolescent, so everyone will be pleased but the main issue is that despite having more than adequate acting chops this large ensemble don’t really get the screen time they deserve. Hugh Jackson also makes an appearance before he heads for the proverbial hills, hairy and blood streaked, it’s a great snippet but is a clue for future sequels rather than anything else. It seems that the days of the apocalypse have come and gone and it is perhaps better to have faith in the future young X-men: Jean Grey, Night Crawler, Cyclops and Quick Silver. These characters show promise that the future could be quite different – and so could the next film.